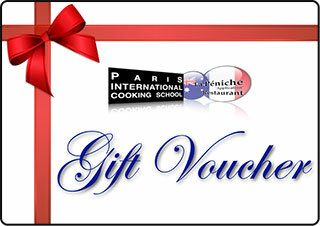 If you were given a Paris International Cooking School Gift Voucher. If the Gift Voucher indicated that you are already enrolled into a Cooking Class or a Weekend Workshop, you don't have to do anything. Just come to the Class or Workshop on the scheduled date. If the Gift Voucher leaves you to choose a Cooking Class or a Weekend Workshop, please refer to our current timetables for Cooking Classes and Weekend Workshops and check the availability. You can select a Cooking Class or a Weekend Workshop that runs after the voucher expiry date. However, please redeem the Gift Voucher before the expiry date.